The mysql module collects and parses the slow logs and error logs created by MySQL. The mysql module was tested with logs from versions 5.5 and 5.7. On Windows, the module was tested with MySQL installed from the Chocolatey repository. If you’ve secured Elasticsearch and Kibana, you need to configure the username and password options in the Elasticsearch output before setting up and running the module. See Configure the Elasticsearch output. The modules enable command enables the mysql config defined in the modules.d directory. See Specify which modules to run for other ways to enable modules. The setup command loads the recommended index template for writing to Elasticsearch and deploys the sample dashboards for visualizing the data in Kibana. This is a one-time setup step. If your logs aren’t in the default location, see Configure the moduleedit, then run Filebeat after you’ve configured the module. Depending on how you’ve installed Filebeat, you might see errors related to file ownership or permissions when you try to run Filebeat modules. See Config File Ownership and Permissions in the Beats Platform Reference if you encounter errors related to file ownership or permissions. 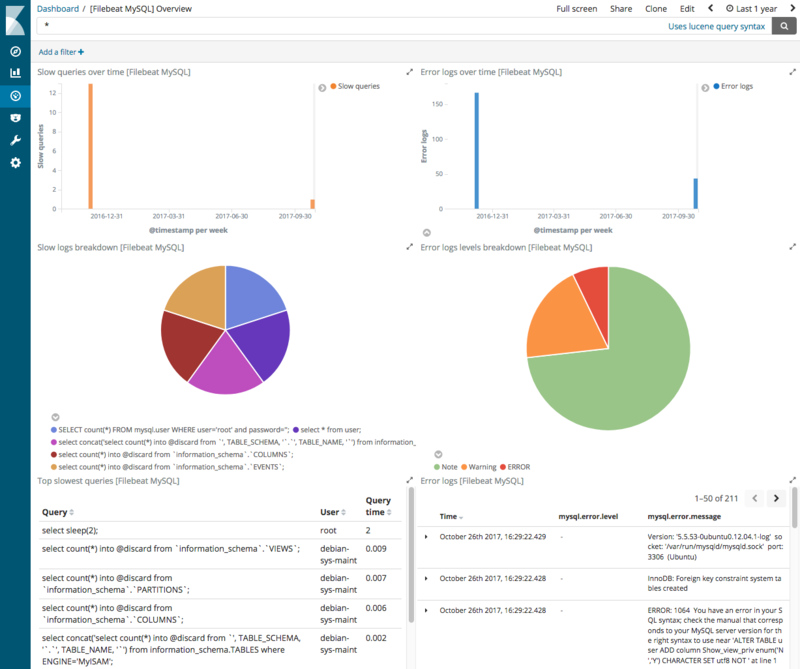 Open your browser and navigate to the Dashboard overview in Kibana: http://localhost:5601/app/kibana#/dashboards. Replace localhost with the name of the Kibana host. If security is enabled, log in with the Kibana username and password that you used when you set up security. Enter mysql in the search box, then open a dashboard and explore the visualizations for your parsed logs. You can further refine the behavior of the mysql module by specifying variable settings in the modules.d/mysql.yml file, or overriding settings at the command line. ./filebeat --modules mysql -M "mysql.error.var.paths=[/path/to/log/mysql/error.log*]" -M "mysql.slowlog.var.paths=[/path/to/log/mysql/mysql-slow.log*]"
The mysql module provides the following settings for configuring the behavior of the module. Each fileset has separate settings. If you don’t specify variable settings, the mysql module uses the defaults. When you specify a setting at the command line, remember to prefix the setting with the module name, for example, mysql.error.var.paths instead of error.var.paths. An array of paths that specify where to look for the log files. If left empty, Filebeat will choose the paths depending on your operating systems.